Texas A&M came into the day with four of the top seven seeds in the 200 breast, but with the numbers 7-13 swimmers separated by only .75, it was going to take four stellar swims to keep it that way. The Aggies were able to pull it off, qualifying Sydney Pickrem (2nd), Bethany Galat (3rd), Anna Belousova (7th), and Esther Gonzalez (8th). Pickrem took second to Lilly King, splitting 29.37/31.99/32.64/32.61 for a final of 2:06.61. Galat split 29.27/31.86/32.55/33.42 (2:07.10), Belousova split 29.77/32.42/33.46/32.34 (2:07.99), and Gonzalez was 29.87/32.34/32.81/32.99 (2:08.01). This isn’t the first time a team has qualified four (or more) for an A-final. Just recently, the University of Georgia did it in the 2015 women’s 500 free with Amber McDermott, Hali Flickinger, Brittney MacLean, and Rachel Zilinskas, and Texas qualified 6 men in the 100 fly the same year (they took 1st-4th, 6th, and 8th): Joseph Schooling, Jack Conger, James Cooper, William Glass, Matt Ellis, and John Murray. Great splits for the Aggie crew. Well coached. It’s not quite Texas men 100fly caliber, but still incredibly impressive. 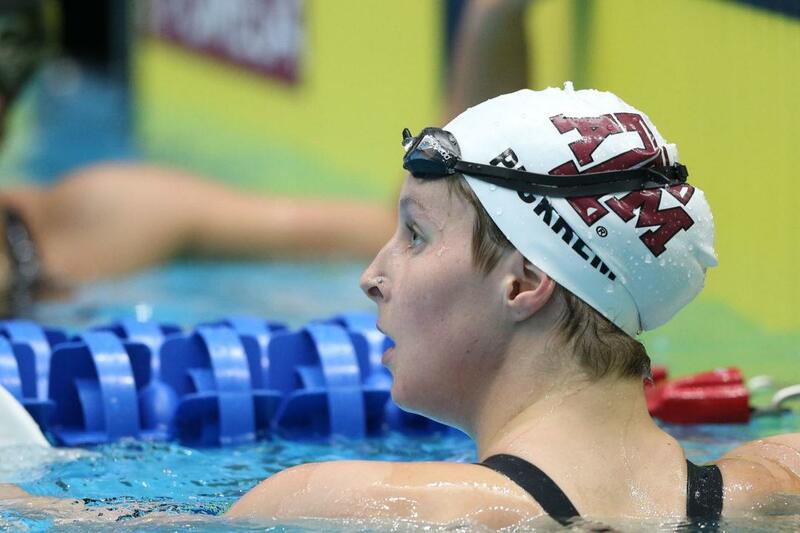 Terrific performances in the 200 breaststroke and, overall, an I mpressive prelim session for the Texas Aggies today. Looks like they’ll finish up the 2018 NCAAs as the best team in the country behind the Cardinals and the Golden Bears.